Amy Carlson, 33, moved to Sydney from Melbourne seven years ago. Two weeks ago, after witnessing a massive surge in property prices, she moved back – with her partner Jamie Hodgson and son Olli. Having rented a three-bedroom house in Randwick for $1000 a week, they realised it would be faster to save for their own house if they moved back to Melbourne, where rent was cheaper. Now they’re in Malvern East, paying $790 for a “massive” three-bedroom-plus-study house. “The prices that we were seeing in Sydney, for the locations we wanted to live in … it just wasn’t going to be what we wanted. The block sizes are a lot smaller and you seem to pay an exorbitant amount of money for that,” Ms Carlson said. They are one of the many young families who have flocked to Victoria, Queensland and Tasmania to find cheaper property prices and a better lifestyle, Australian Bureau of Statistics data shows. While the ABS doesn’t define ‘young families’ as a category, the interstate migration of children, and adults up to the age of 45, paints a clear picture of those who fit this demographic. Net migration figures – the difference between those migrating into a state or territory and those leaving – found more 10 to 14-year-olds left NSW in in 2015/2016 than in any year since the GFC. A similar pattern was seen for children in the 0 to four and five to nine age brackets. But while there had been a slowing outflow of those in their 30s and early-40s since 2011, this reversed in 2015/2016. The only category where, overall, NSW had net growth in that time was from 25 to 29-year-olds, which could be explained by growing student numbers. Urban and Regional Planning and Policy chair at the University of Sydney Professor Peter Phibbs said the statistics could start to mirror the early 2000s, where there was a surge away from Sydney after a house price boom. “What we’ve seen is a pattern in Sydney which does respond to house prices,” Prof Phibbs said. “High [property] prices are a huge problem for people starting a career or a family, and it causes talent to leave – usually to Melbourne,” he said. In Victoria, the net internal migration statistics show every age group experienced a net increase in 2015/2016. Those in their 20s led the pack, followed by those in their 30s and the 0 to 4 age group. And looking at the median property prices and rents, it’s not hard to see why Melbourne is proving more popular to families in Sydney. BIS Shrapnel senior manager residential Angie Zigomanis said young families could find new land blocks within 35 kilometres of Melbourne CBD, in areas such as Melton or Tarneit, for under $250,000. “In Sydney, it’s $400,000 and you’re 40 or 50 kilometres out in Camden,” Mr Zigomanis said. For those looking to buy a house, the median Sydney price is above $1.1 million – $300,000 more expensive than in Melbourne. For renters, it’s also a much more favourable situation in Melbourne. Domain Group data from December shows house and apartment rents in Sydney at $540 and $520 a week respectively. In Melbourne, the median asking rent was $410 and apartments were $380. YourLand Developments director Mark Erskine first noticed more Sydney buyers for their house and land developments in Melbourne’s western suburbs 18 months ago, and said the trend had been increasing ever since. About 30 per cent of buyers for their River Valley Estate in Sunshine North and other project called Seventh Bend in Melton South are from Sydney, and the majority of these were home buyers. “Even where Melton is located, it’s still far closer than where first home buyers have the opportunity of buying in Sydney, on the outskirts of Sydney,” he said. Victoria isn’t the only state attracting young families and couples. Queensland has also been a location of choice. Brisbane’s median house rent was $400 a week, with house prices less than half that of Sydney’s – at $540,758. PRDnationwide national research manager Diaswati Mardiasmo said the lower median price, steady price growth and strong commercial and infrastructure investment was making the area attractive. She said there had been a big increase in inquiry from the southern states. An analysis of purchasers’ addresses for Queensland projects found an increase in interstate buyers from 4.4 per cent in 2010 to 13.6 per cent in 2016. But some are going even further afield. 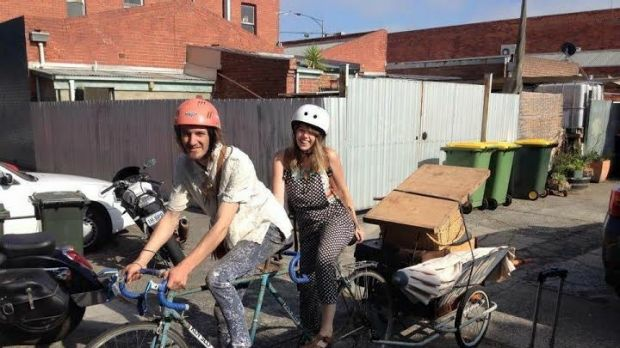 Former Melbourne residents Hannah Gooley, 29, and her partner, Alan, 26, were on a commercial lease in Melbourne, with an open door co-op when they were told their rent was being increased by 15 per cent. They believed it would continue to climb. “It was a sad realisation and we considered doing it for one more year, but what was the point when the rent would only soar again the following year,” Ms Gooley said. As they worked for themselves the need to be near an employment hub – such as Sydney or Melbourne CBD – was not as pressing. So they relocated to Tasmania. The median rent for a house in Hobart is $355 a week. “While income may be lower, access to beautiful natural spaces means we can work and play at a slower pace,” she said. First-Home Buyers Australia’s Taj Singh said key workers, including those working in nursing, childcare and hospitality, would also be more likely to move. But a survey they undertook found just 5 per cent of first-home buyers were set on purchasing interstate, with a further 11 per cent “undecided” on whether they’d yet make that move.